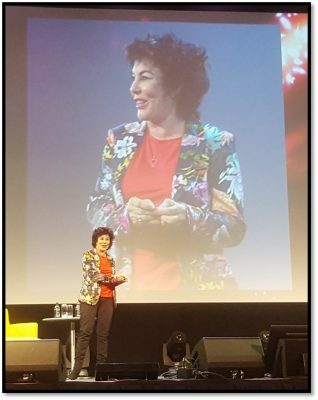 According to Ruby Wax at Pendulum Summit 2019 in Dublin recently stress is good. And she’s right! Stress is what keeps us alive and vital. The Amygdala (ah – MIG – d’lah) is an ancient part of the human brain that is responsible for the fight or flight response that we are all familiar with. It’s an almond shaped cluster of nuclei located deep in the frontal portion of your brain, right in the middle and sort of half-way between the back of your eyes and your ears. You know the score. Something startles you and you go from cruising through your day (or even your night fast asleep) and instantaneously you are wide awake and ready for fight or flight; The brain becomes hyperalert, pupils dilate, the bronchi dilate and breathing accelerates. Heart rate and blood pressure rise. Blood flow and stream of glucose to the skeletal muscles increase. Organs not vital in survival such as the gastrointestinal system slow down. Daniel Goleman in his wonderful ‘90’s tome on Emotional Intelligence, refers to this as an ‘amygdala hijack’! But we also know that too much stress for too long can kill! How can something be both good and bad at the same time? The answer lies in the gap. Can you hear it? That pre-recorded male voice playing incessantly in many London Underground stations warning us to “Mind the Gap” – can you hear it? I can. The question is are we trained, have we trained ourselves to Mind the Gap? I’m sure some of you can relate to Ruby who spoke of her proneness to getting angry with stupid people and her subsequent, life-enhancing decision to learn how to “Calm the red mist down.” She learned how to Mind The Gap. This year, we need to learn how to mind the gap better than we did last year by thinking more about self-care but perhaps some of us have to first learn to accept that self-care is not selfish. Indeed, Dr. Niall Muldoon, Ombudsman for Children, alluded to it in his keynote at the IPPN (Irish Primary Principal’s) Conference earlier this week, when he put up a slide with L.R. Knost’s quote, “Taking care of myself doesn’t mean ‘me first’ it means ‘me, too.’” How wonderfully clarifying is that? Recently I coined the acronym POYOOMF which stands for “Put On Your Own Oxygen Mask First” a phrase we are all familiar with from the safety demonstrations on flights. The premise is very simple – we need to put on our own oxygen masks first SO THAT we can look after others around us should there be an emergency on the flight. Surely the same is true of life in general? We can only truly be of service to others if we take time regularly to take time for ourselves. Put On Your Own Oxygen Mask First – Mind The Gap! “The Big Rock” is the element of your looking after yourself that needs most work now. You need to figure out what The Big Rock. Thankyou! This is a great article that resonates. I love your quotes and how true and relevant they are. I’ll be putting your suggestions into practice.